Built By Our Family. Made For Yours: T5 Series Tier 4B tractors are the perfect fit for the many jobs on dairy, livestock and mixed farms—and the perfect fit for your family. These deluxe, high-powered 4x4 ag tractors are a blend of everything you want—the power to handle your toughest jobs, the ability to work effectively in tight places and the ease and comfort your family craves. 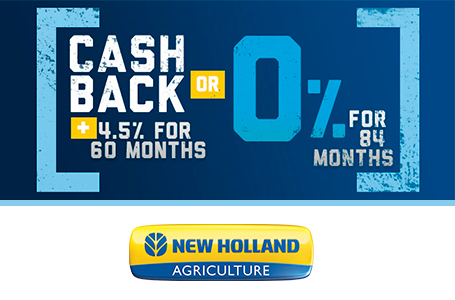 Perfect Fit: New Holland designed the new T5 Series farm tractor line to suit your needs perfectly. These heavy-duty, four wheel drive, mid-size tractors are nimble. They turn on a dime, with a wheelbase, chassis and turning radius that have been calculated to make it easy to maneuver wherever you need to work. Perfect Feel: Whether you are using the T5 to work around feedlot, poultry operation, haying, loading, mowing or feeding beef cattle, the deluxe VisionView™ cab with Command Arc console serves as your new field office with ultimate visibility and comfort. You get an ultra-smooth ride courtesy of Comfort Ride™ cab suspension and optional suspended front axle. 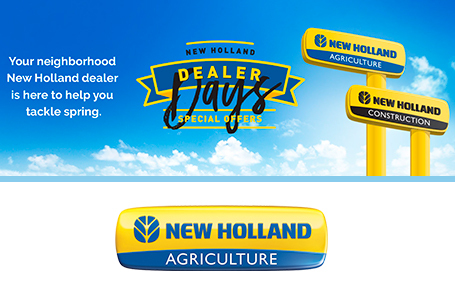 Perfect Speed: New Holland now gives you the convenience of Hi-Lo speeds with the 24x24 Dual Command™ transmission. Or choose the Electro Command™ semi powershift transmission that gives you eight thumb-button powershifts without making a shift lever range change. Add the AutoShift™ option and gear shifting is handled for you automatically. Cab Comfort—it's All About The View: The deluxe VisionView™ cab has been designed around you for the ultimate operator experience. Panoramic visibility is guaranteed with the expansive arched front windshield, high-visibility roof panel, curved and openable side windows and an extended rear window. The new tilting and telescoping steering wheel, dashboard instrument cluster and controls move together for better visibility and control. Optional enlarged heated wing mirrors feature an electronically adjustable top section for the best possible view of the road during high-speed transport. The adjustable lower section has been designed to effectively counteract blind spots. Always Keep An Eye On Your Loader: The high-visibility roof panel is engineered to give you a perfect view of the loader at full extension without having to crane your neck. This uninterrupted visibility enhances your productivity. Smooth Operator—the Comfort Ride™ Cab: You’ll enjoy unsurpassed ride smoothness and reduced fatigue with the Comfort Ride™ cab suspension option that cushions you even when travelling across the harshest terrain. It provides up to a 25% reduction in shock loads reaching the operator. Matched with the Terraglide™ front axle suspension option, you get the smoothest ride possible, optimizing productivity. Deluxe Air-Suspension Seat: The deluxe air suspension seat features controls that are easy to identify so each operator can make quick, precision seat adjustments. The optional full sized matching upholstered instructor seat/buddy seat with seat belt completes the comprehensive seating offering. To the left of the operator seat is a convenient storage compartment and easy-to-access fuse panel. Convenient Command Arc Console: All principal controls are grouped on the Command Arc console to put convenience at your fingertips. It’s a difference that provides for comfortable, day-long operation and less fatigue. New LED Work Lights: The all-new optional lighting offering features four LED corner roof work lights—two front and two rear—plus signature running lights. 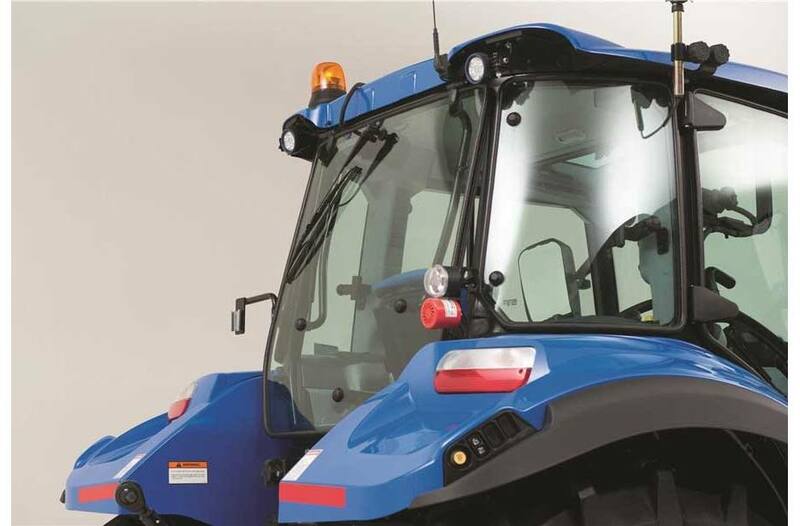 Brighter and less power-consuming than their standard equivalent, LED lights offer a broad spread of white light—7800 lumens—that’s more than you’ll find on other tractors of this size. Open-Air ROPS Comfort: The spacious T5 open ROPS platform is available on T5 models equipped with the Dual Command transmission. It features a true flat deck, with no driveline hump and with pedals that are suspended so you get plenty of legroom. The Command Arc console for exceptional comfort, and the Lift-O-Matic™ Plus lever provides additional ease of operation enabling single lever control of the rear hitch. Clean Performance. 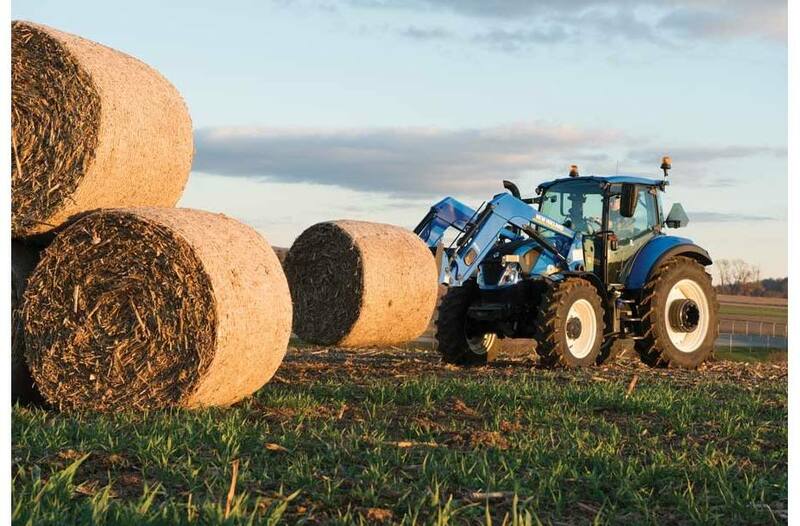 Responsive Productivity: T5 Series tractors deliver the power you need for loading, making hay and much more. They boast the latest in engine technology, featuring 3.4-L, 4-cylinder, 16-valve engines with common-rail fuel injection to maximize power and efficiency. These super-quiet engines develop between 107 and 117 horsepower and up to 362 lbs/feet of torque for guaranteed productivity. 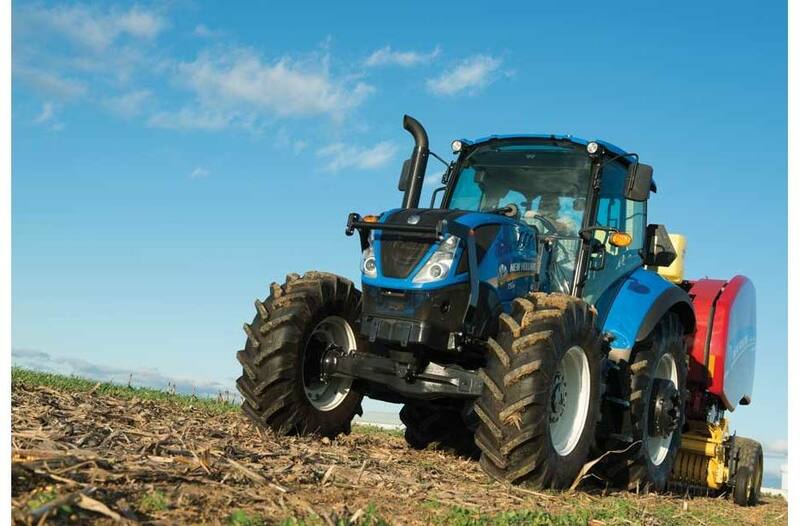 Add in a power-to-weight ratio of 85.7 lbs/hp and the T5 is your perfect farming partner. Tier 4B Emissions Compliant: T5 Series engines fully comply with the stringent Tier 4B emissions regulations. They use ECOBlue™ Compact HI-eSCR System (Selective Catalytic Reduction) with light CEGR (Cooled Exhaust Recirculation) to achieve low emissions. This solution requires no diesel particulate filter (DPF) and no need for regeneration or operator input or the inconvenience of stopping. It all adds up to outstanding efficiency, which is what you’ve come to expect of the Clean Energy Leader. 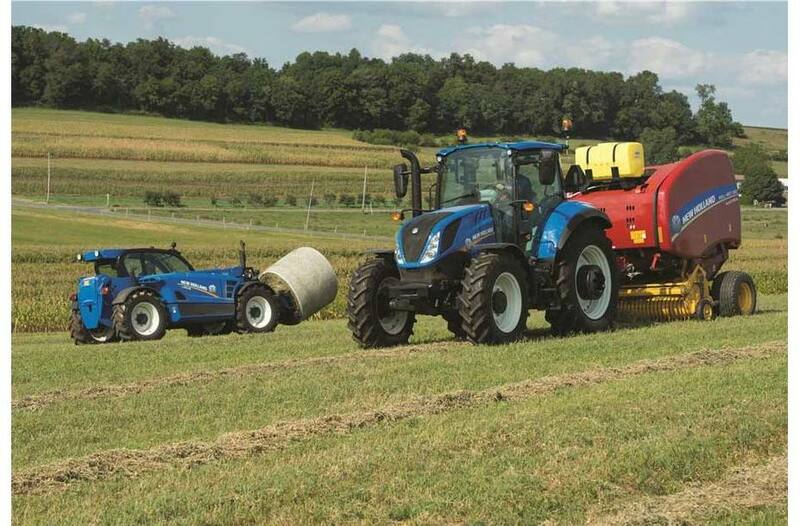 ECOBlue™ Compact HI-eSCR Explained: New Holland ECOBlue Compact HI-eSCR technology gives you the benefit of the highest NOx conversion efficiency in the industry. This multi-patented system uses a new Engine Control Unit, which not only manages the engine, but also the HI-eSCR after-treatment system by controlling the supply and dosing modules. Using a dedicated closed loop system, it continuously monitors the NOx levels in the exhaust gases, ensuring that during every cycle the precise amount of AdBlue® (DEF) is injected to achieve NOx conversion of over 95%, all while guaranteeing low fluid consumption. 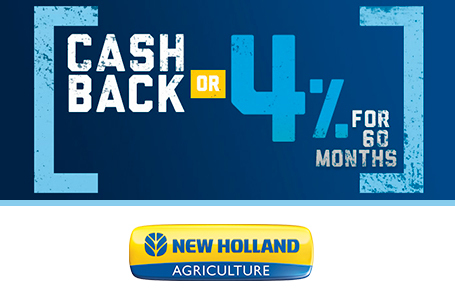 Proven Technology From FPT Industrial: New Holland is not going it alone when it comes to Tier4 technology. They can draw on the experience of their in-house engine development specialist: FPT Industrial. The award-winning Hi-eSCR solution has been extensively tested and has clinched numerous awards. More Power, Torque Rise and Response Than Previous: With four valves per cylinder, the T5 engines “breathe” better and achieve better performance by maximizing power output from each cylinder. 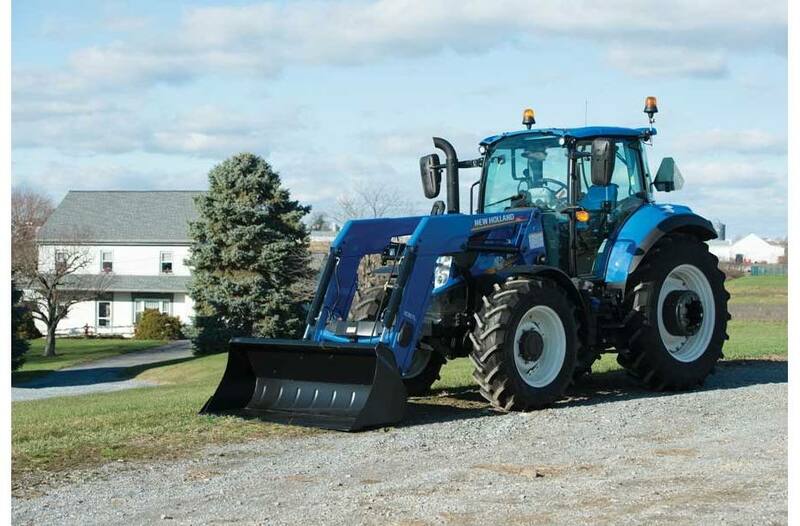 This improved performance translates into increased lugging power and efficiency. The Importance of Transient Response: Transient response is your productivity guarantee. Put simply, since your T5 engine breathes only clean fresh air, it can react more quickly when placed under load. So when you’re transporting fully loaded trailers or grain carts and you encounter a hill, you’ll be able to maintain constant forward speed with quicker engine rpm recovery. Simple ESM. Taking The Hassle Out of Throttle Control: A versatile mid size tractor needs to be equally suited to PTO and heavy draft applications. With Engine Speed Management (ESM), the advanced engine management system precisely fuels the engine so it accommodates fluctuations in engine load while maintaining the desired engine speed. For convenience, two engine speeds can be memorized. You can then simply toggle between the speeds using a button on the transmission controller. The Perfect Speed: New Holland offers a choice of transmissions to match your applications and your preferences. 24x24 Dual Command™ Transmission: This easy-to-use transmission makes a big difference in your day. It gives you a Hi-Lo speed in each of the four gears within the three ranges. Simply use the push buttons on the side of the control lever. In addition, the Dual Command transmission offers a PowerClutch button that allows you to shift between gears within a range without clutching with your foot, as well as a smooth, left-hand electrohydraulic shuttle lever that conveniently returns to the central rest position for quick direction changes. Select from three shuttle aggressiveness settings using a rocker switch. 16x16 Electro Command™ Semi-Powershift: The Electro Command™ transmission gives you eight thumb-button powershifts without making a shift lever range change. You can see the selected gear at a glance thanks to the large gear display. Top transport speeds of 25 MPH (40kph) are achieved at a mere 2040 rpm (with 18.4-34 rear tires). The result? Your T5 will slash your fuel bills while reducing in-cab noise. AutoShift Modes For Comfort and Productivity: Add the AutoShift™ option with the Electro Command transmission and gear shifting is taken care of for you automatically. With Auto Transport, the tractor shifts seamlessly through eight speeds like a vehicle with an automatic transmission. Auto Field mode manages both the engine speed and transmission to optimize performance and economy. In power-take-off (PTO) applications, where a constant engine speed is the priority, the system will select the transmission ratio to match the load on the engine. In draft applications, engine speed is allowed to drop to fully exploit the available torque rise before selecting a lower ratio under load. Ergonomic Power Shuttle with 3 Aggressiveness Settings: You can operate the convenient, column-mounted electro hydraulic power shuttle without taking your hand off the wheel for increased safety during loader work. You can even regulate the shuttle aggressiveness setting with an ergonomically positioned switch. Select soft for general field work, standard for daily tasks and the aggressive position for near instantaneous direction changes during loader work. You can even change the setting while on the move. Optional ISO BUS Class 2: ISO BUS Class 2 allows you to control all of your implements—balers, mowers and more—using your T5 IntelliView™ IV tractor monitor (optional parts supplied). TerraLock™ Automatic Traction Management: New Holland’s renowned Terralock™ system is simple to setup and operate. It automatically controls four-wheel drive and differential lock engagement. Forward speed and steering angle information dictate engagement. When making tight turns, the system automatically disengages to guarantee the tightest turning and reduce strain on the driveline. Rugged and Maneuverable: T5 tractors are designed with a wheelbase, chassis and turning radius calculated to make it easy to maneuver wherever you need to work. Class 1.5 Front Axle: T5 Series tractors feature new heavy duty Class 1.5 front axles—your choice of a fixed axle or the Terraglide™ suspended front axle. TerraGlide™: Outstanding Traction, Unsurpassed Comfort: The optional New Holland Terraglide™ suspended FWD axle protects the tractor, mounted implements and the operator from heavy shock loads. In the field, the advanced suspension system maintains contact between the tires and the ground for improve traction, which helps ensure a silky smooth ride on even the roughest terrain. Productive and Versatile: New Holland designed the T5 with your many jobs in mind—from front loader work to PTO and three-point mounted field implements. Hydraulic Flexibility: The T5 hydraulic system has tandem hydraulic pumps that work independently—one dedicated to the high-pressure circuit for hydraulic remotes and three-point hitch, and the second for the low-pressure circuit for steering. Up to three closed-center remote valves are available. Easy Joystick Control: Mechanical or Electronic, The Choice Is Yours: You can specify your T5 with one of two mid-mount remote valves to operate a loader or specialized equipment using an integrated joystick. The mechanical joystick—mounted on the Command Arc console—offers robust functionality with positive engagement or select the electronic option—mounted on the seat armrest—for precise finger-tip actuation. High-Capacity 3-Point Hitch: T5 tractors offer a three-point lift capacity up to up to 8,084-pounds, so you can handle the heaviest implements. Fender mounted hitch and power take off (PTO) controls make it easy to attach and remove an implement. Auto PTO Operation: Here’s a handy feature. With Auto PTO, the PTO disengages when the rear three-point hitch reaches the position you and tractor. A 540/1,000 rpm PTO is standard equipment, with a 540/540E/1000 rpm PTO optional. Fully Integrated Front Loaders: If you need to move bales, feed, dirt or stone, order your T5 as full loader ready from the factory. 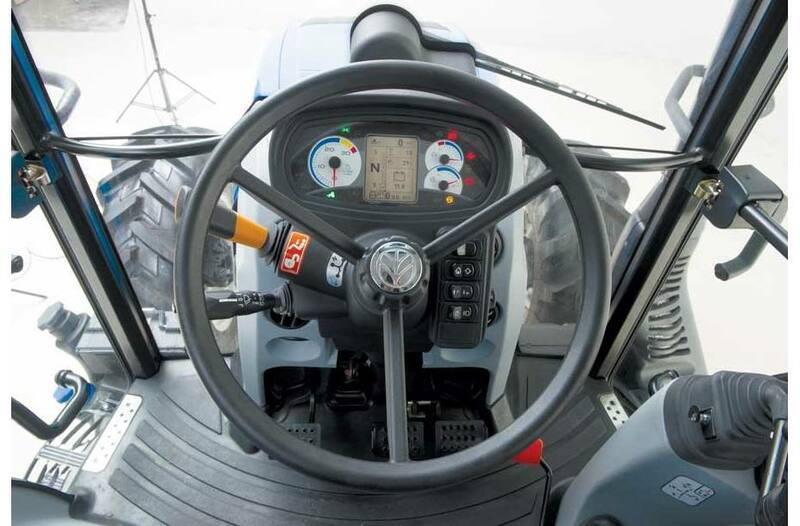 The T5 is the perfect loader tractor thanks to the fast-responding loader joystick control, easy forward/reverse shuttling and superior visibility. Choose a loader with non-self-leveling (NSL) or mechanical self-leveling (MSL) capabilities. Regardless of the model you choose, both can be equipped with either a skid-steer-style or European-style attachment system. Simple Maintenance: T5 Series tractors are designed to spend more time working around your farm and less time on maintenance. Engine oil check and fill points are easy to reach, with no need to lift the hood. This makes routine checks faster and servicing simpler. The long, 600-hour engine oil change interval helps too, so your T5 tractor spends more time working, less time servicing. 360° Access: The single-piece engine hood opens wide for full service access. Engine side panels are easy to remove for convenient access to the engine oil filter and other components. The cooling package opens out to make cleaning faster and easier. The engine air filter is easy to check, clean or replace, with no need for tools. And, you can view hydraulic oil levels using the sight glass at the rear of the tractor. Simple Cab Filter Changing: It’s convenient to change the cab air filter from ground level. Easy Fill-Up: The 3.2-gallon AdBlue® DEF tank’s filler neck is narrower than that of the standard fuel tanks, which prevents inadvertent filling with fuel.